NASA has created an expert panel to investigate what went wrong during a July 16 spacewalk that had to be cut short when water began filling the spacesuit helmet of one astronaut in a scary malfunction. A NASA engineering team is already studying European Space Agency astronaut Luca Parmitano's spacesuit and life-support equipment, looking for the cause of the unprecedented leak that could potentially have drowned the astronaut if not caught in time. The newly created board will take a complementary tack when its work begins on Aug. 2. Meanwhile, NASA is scrambling to load a spacesuit repair kit onto a Russian cargo ship launching to the space station on Saturday (July 27), agency officials said. Richard Fullerton, International Space Station safety and mission assurance lead, Office of Safety and Mission Assurance, NASA Headquarters, Washington, D.C.
Joe Pellicciotti, chief engineer, NASA Engineering and Safety Center, Goddard Space Flight Center, Greenbelt, Md. Parmitano and NASA astronaut Chris Cassidy ventured outside the space station on July 16 to conduct a variety of repair and maintenance operations, and to help prepare the orbiting lab for the arrival of a new Russian module later this year. The excursion was supposed to last 6 1/2 hours, but controllers stopped it after just 92 minutes because water began building up in Parmitano's helmet. "There is some in my eyes, and some in my nose," Parmitano said during the spacewalk. "It's a lot of water." 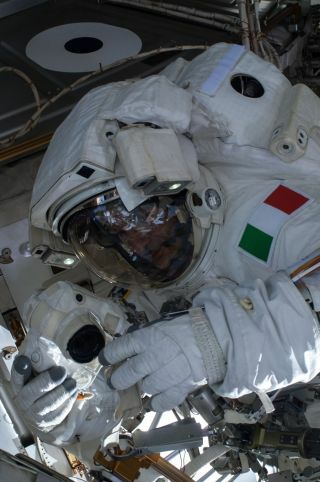 The Italian astronaut and his NASA colleague made it back inside the space station safely, and both of them are fine. NASA officials later determined that a total of 34 to 51 ounces (1 to 1.5 liters) of water leaked into Parmitano's spacesuit, with most of it gathering in his helmet. The cause of the leak remains undetermined, but engineers suspect a fault in the suit's cooling system. As part of its effort to understand the mishap and prevent similar issues in the future, NASA is planning to send some spacesuit-repair tools up to the station aboard Russia's unmanned Progress 52 cargo ship, which will launch Saturday from Baikonur Cosmodrome in the central Asian nation of Kazakhstan. "They're working to get some small spare parts, basically, and some tools that the crew could use to either repair or to help contain and investigate the suit issue that we have with Luca," said NASA spokesman Josh Byerly of JSC. "They're keeping it small, because obviously the 52 Progress is already full," Byerly told SPACE.com. "We're having to make sure that we can get it manifested and get it on there. But as far as I know, everything's proceeding according to plan."